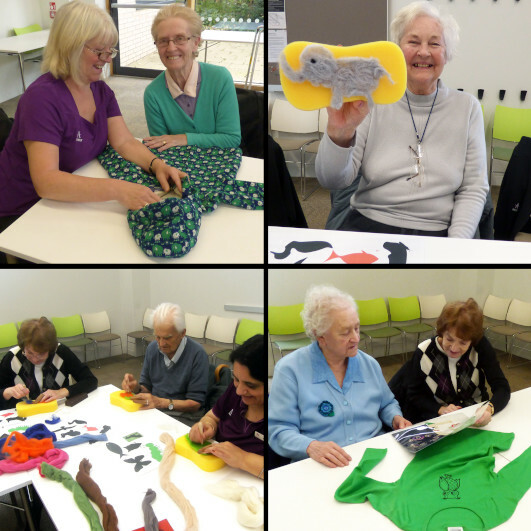 Older people from across Leeds created archive-inspired artwork that was exhibited at the M&S Company Archive. 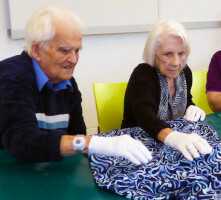 The group, from care homes Simon Marks Court and Halcyon Court, worked with artist Sarah-Jane Mason and the archive collection to create fabric squares using different techniques. Objects from 1950s food packaging to a 1970s kaftan inspired batik, needle felting and tie dye fabric squares. At the end of the project the squares were pieced together to create two wall hangings. After going on show in the archive, the hangings went to their permanent homes in each of the care homes. The archive objects inspired memories which in turn inspired the creative process. As well as reminiscing, the participants learned new skills, expressed themselves and built new friendships. Bottom: Jean, Joan, Chris, Doreen, Jan, Aziza and Clara making archive-inspired needle felt.